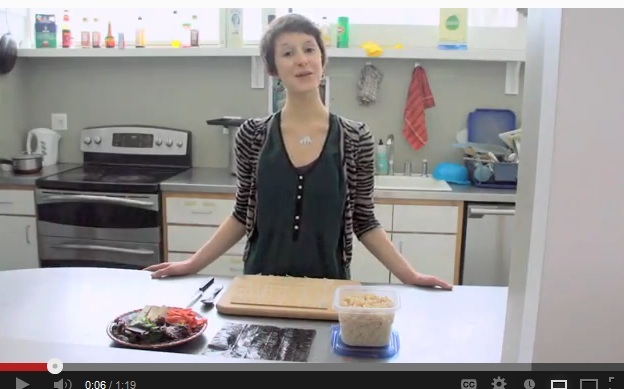 In the premiere episode of Vassar’s own cooking show, Farmers Market Vegan, Alessandra Seiter ’16 demonstrates how to craft delicious, fish-free sushi in the comfort of your own home. To follow along with the recipe and learn more about vegan sushi, visit Alessandra’s Farmers Market Vegan blog. Ali, you are amazing! You have so much energy! If we can’t eat brown rice, which other “pseudo grains” would you recommend – millet, quinoa, teff, etc. that would have the best flavor and texture? I think my rice sushi typically had a little vinegar or something in it, can’t remember. Do you put anything in your rice or is it just plain? Thanks – looking forward to your adventures in the kitchen and on the screen! Hello, Roberta! Thanks for commenting. I’d recommend a mixture of quinoa and amaranth for the stickiest and heartiest texture. In this recipe, I didn’t season the rice with any vinegar, though I have definitely done so with ume plum vinegar in the past. Thanks again for your support!